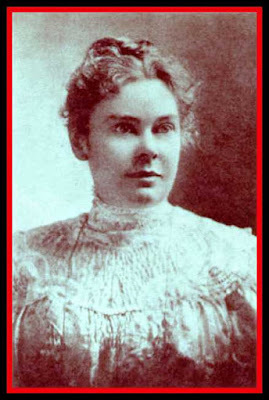 Yesterday, June 1, marked the 89th anniversary of the death of Lizzie Borden, who died at the age of 66 in her hometown of Fall River, Mass. -- 34 years after a jury acquitted her in the ax murders of her father and stepmother. I won't go into all the (literally) gory details of the double homicide that took place Thursday, August 4, 1892 at the Borden household. You can get the basic details HERE. I just want to honor Lizzy's musical legacy. It's richer than you might think. Gave her mother 40 whacks. What children actually sang this song, Wednesday and Pugsley Addams? But that's not the only music to come out of the murders. Premiering in 1948 was a Lizzie ballet, The Fall River Legend by American choreographer Agnes de Mille. The score was composed by Morton Gould. It opened at New York's Metropolitan Opera House. Who knew Lizzie was so graceful? Here's a video clip of a later production. And speaking of high culture, there also was a Lizzie Borden opera. This was composed by Jack Beeson in 1965 and was performed that by the New York City Opera, conducted by Anton Coppola. This clip features several scenes from the opera. The 1960s folk group called The Chad Mitchell Trio took the black humor route. Fast forward to the 80s where an Arizona thrash band called Flotsam and Jetsam embraced the darkness of the Lizzie legend. And in 2003 The Dresden Dolls used the Borden murders as a launch pad for this depressing ditty. They got the number of whacks wrong, but so did the famous kiddie song. Abby Borden only suffered 19 blows while Andrew Borden got 11. There are other songs about young women committing unspeakable murders that had to have been influenced by Lizzie Borden. Tom Lehrer's "The Irish Ballad" is one. And so is Nick Cave's "The Curse of Milhaven," whose murderous narrator Loretta might be a younger version of our Lizzie.